My bro Will Strohl has challenged me to a little fundraising for the Team LIVESTRONG Challenge in Davis coming up next month. He has stepped up, in addition to his previous donations to my ride, to donate $1 for every mile I ride a bicycle between today (May 22nd, 2012), and Sunday May 27th at 11:59PM. Why is he doing this? He knows I haven’t been on a bike in over a week, so he figures it is probably a safe bet, and perhaps it is. Will you donate $1 to my #LSCDavis ride, for every mile I ride by bike between now and 11:59pm PDT this Sunday? This year I said one of my goals is to ride in a century, a 100 mile bike ride. I’ve chosen the LIVESTRONG Challenge in Davis California on June 24, 2012. All I am asking is that you donate $5 (more if you like) to the cause. Just $5 to help people around the world effected by Cancer. Below is more info on why I am riding in the LIVESTRONG Challenge this year. I am riding the 105 mile distance at the 2012 Team LIVESTRONG Challenge Davis for four special people in my life, all affected by cancer. As part of the event I have set a goal of raising $1,000, I would appreciate any amount that you can donate to my cause, you can use the link on the left side of this page to DONATE NOW. Who am I riding for? I am riding the #LSCDavis for four people, all affected by cancer. 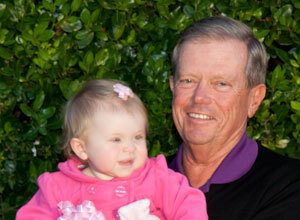 My uncle John, married to my father's sister, has been battling cancer for a number of years now. My auntie Carol was diagnosed with breast cancer and successfully beat the disease. One of my best friend's mother Janice was very recently diagnosed with breast cancer and is going through the treatment process now. These close friends and family are my motivation for doing the LIVESTRONG Challenge in Davis this year. As of January of 2012 the longest bike ride I've ever done was 30.3 miles, that was in August 2011. If all goes as planned, I will surpass that total multiple times this year. Please stay tuned to my training and ride results by checking out the LIVESTRONG blog posts here no my site. Last year I purchased a 2011 Cannondale Quick CX 1 to start riding on my quest to hit 500 miles for the year. I was able to do that fairly easily on the bike, it is a great machine. As I am getting more into riding though I wanted to do longer distance road riding, and continue to use the Quick CX 1, but on a different basis than I did in 2011. I intended to take that bike, with the OEM wheels, and put a set of mountain bike tires on it and use it as a semi mountain bike trail bike. My awesome brother sent me a set of 29x2.1” mountain bike tires, and I picked up some tubes at REI a few weeks ago. This evening I tried to put the tires on the rim, the first thing I ran into was thinking that there was no way the tire would mount to the rim, it looked huge with the likely hood of it fitting being very small. 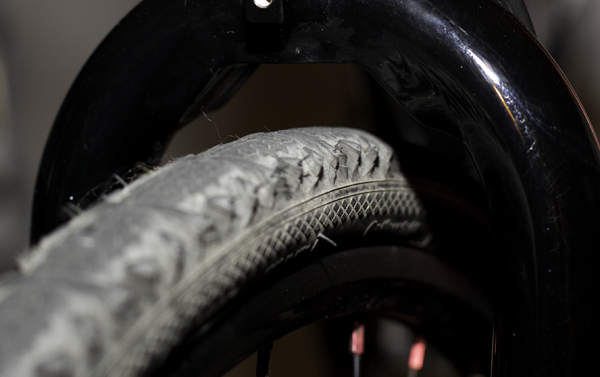 Well I was wrong about that, the tire and tube went together well and everything fit on the rim nicely. That is when it went downhill though. I put the wheel on the bike and immediately noticed it wouldn’t rotate, I figured I had the quick release off and the disc brake was rubbing. Upon further inspection though, after resetting the quick release I noticed that the tire was actually rubbing on the top of the fork. 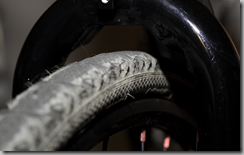 Here’s a picture of the original tire and fork, taken after removing the MTB tire and tube. So I guess the answer to the question, if the question is “Will a 29x2.1” tire fit on a 2011 Cannondale Quick CX 1?” is NO. Unfortunately it will not. I’m still going to try to find something that will work on the bike though, I would like to use it off road more, though I don’t think I’m ready to invest in a full on mountain bike anytime soon as I still see putting in a lot more road miles this year. So, here we are, July 10th, 2011, day 191 of the year. So where are we at in terms of the fitness goals? On January 1st I posted that I wanted to ride a bike for at least 500 miles this year, and I wanted to skate at least 100 miles. To be honest, things got off to a slow start, especially for biking as I didn’t ride a bike until May. In January I got a couple of skates in, though not as many as I would have liked. I then didn’t skate until today, far too long. That’s my goal for this week, to ride 50 miles. In all honesty, it isn’t that much, but I can with about 99% confidence say that I have never ridden a bike 50 miles in one week. Yesterday afternoon I went for a ride up Highway 1 to Moss Beach, and then over towards the ocean. My first time really climbing on a bike. It wasn’t much of a climb, but according to my Garmin I did gain 1,118ft in elevation, far more than any other ride as of late. So here we go again, we’re less than two weeks out from our scheduled move. Time to start throwing things away! This weekend will be spent going through the closets, and mainly through the garage. I am hoping to get a collection of things together to take to the Goodwill store this weekend. We’re also hoping to get out to the bay shore trail. Natalie got a new bicycle for Mother’s day, so we are hoping to make our way out to the trail so she can ride as I push the baby along in the running stroller. I’m hoping I can skate with her, we’ll see how that goes. So I was hoping to get going on my fitness goals for the year this weekend. 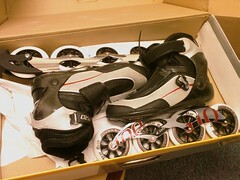 To recap from my 1/1/11 blog post, I would like to bike 500 miles, and inline skate at least 100 miles. As of right now getting the bike anywhere to ride will be difficult because I don’t want to put it in the CX-7 and we don’t have a bike rack yet (hopefully soon). So I decided to skate, the first time in quite a while. I went out yesterday to Redwood Shores and skated on the path there near Oracle’s headquarters. I skated 5 miles, just under 29 minutes total, not bad considering I haven’t done anything in quite a while, but not great for my past times. But I wanted to get out and do it, get the pain over and done with so I can skate on a more regular basis. Should I skate a marathon? So I found out that there’s an inline skating marathon in Napa valley coming up on June 6th (my dad’s bday). I haven’t skated, or done much of anything cardio wise in the past 6 months (cept some running on the treadmill back in January). Wonder if I could get myself together enough to skate 26 miles in the next 3 weeks? I obviously wouldn’t be trying to do the marathon for time, just to do it. I think I might give it a go, though if I am going to I need to get out on my skates this weekend! I’m gonna have to dust them off and charge up my Forerunner 305. Anyone else in the Bay Area up for some skating? I might be a big guy, but I tell you I love to skate, I’ve got four pairs of inline skates :) These are the ones I use for fitness now K2 Radical Pro In-Line Skates . So a few weeks ago (6/26) I skated 10 miles, I would have gone 11 miles but my skates broke! I wasn’t exactly thrilled about this, but at the same time I wasn’t all that distraught. My skates had been hurting my feet, pretty bad actually, but I didn’t want to spend the money on new ones. My skates were K2 Radical 100s that I had purchased in May of 2007. I’ve had experience dealing with K2’s customer service in the past (circa 1995) so I shot them an email to see if they could do anything about them. K2 took a few days to get back to me, confirming that the skates were indeed outside of the year warranty (I knew this) but suggesting that I send them in through my dealer so that they could look at them and see if they might be able to do something, even outside of warranty. So I called my dealer, an online shoe retailer, who I will fail to mention as I really don’t want to get anyone there in trouble. They couldn’t figure out why I wanted to return my skates as they were outside of the 365 day return policy, but they said they would call me back nonetheless. Well 24 hour later I got an email asking me to call in. I called, and to my surprise the dealer told me they were going to give me my money back on the skates. Twenty-five months after purchase I had the full purchase price refunded to my credit card! Holy crap, that was cool. So this was last week some time. I knew which skates I wanted, the 2009 K2 Radical Pros , but the cheapest price I could find for them was $399, and that price wasn't from Amazon. So I decided I would just wait. Well, fast forward to this past Saturday night (after midnight), I was surfing Amazon's website and came across the 2008 K2 Radical Pro skates , not what I was hoping for, but I figured they would be way better than having a broken pair of skates. I also noticed that Size 13 was going for $269, just days earlier they were $399, so I jumped on them, even with overnight shipping (due to Amazon Prime) they were only $273. I didn’t get a chance to use them yesterday because I had made plans with Natalie to scrub down the horse trailer out a the barn. Well tonight after work I took them for a spin on Grant’s Trail, 6.38 miles in just under 40 minutes. I think I could have done it in around 35-37 minutes had I not gotten stopped by stop lights, stop signs, and a minor spill. I haven’t fallen on a pair of skates (inline hockey doesn’t count) in YEARS, probably 6 or more. Oh well, a few minor scrapes on the knees are all I have to show for the spill, fortunately I was at a stop when I ended up falling down, though it was right in front of a Suburban, thankfully she was also stopped. Once we get settled into Colorado I’ll attempt the 50 miles in 30 days goal again, though maybe if I’m lucky I’ll get it done in the next 30 days, even with the move. So I need a goal in my skating, here it is 50 miles in 30 days. I started yesterday, 6/15, so I’ve got until 7/15 to reach the goal. Why 50 miles? Well in the past year (after yesterday’s skate) I had done just around 50 miles on my K2’s. 50 miles in thirty days shouldn’t be too hard to do, but the key will be to actually continue to keep skating. As of right now I’m at about 12.6 miles, skating 6.3 yesterday and today both. Yesterday’s account is posted on Connect.garmin.com, but today’s isn’t, apparently my Forerunner didn’t charge last night, so it didn’t last at all today. I skated the same route as yesterday, Grant’s Trailer, today hurt though. I had to stop and rest for a while, whereas yesterday I felt fine the whole way. I don’t know if it was the heat, 90+, the fact that I slept 4.5 hours last night (was up late reskinning www.dnnvoice.com) or that I had two granola bars and a smoothie to eat all day. Lesson learned, sleep more, eat better, and move somewhere cooler! I likely won’t skate again until Sunday, at least not outside. I’m hoping to play inline hockey tomorrow night with the old gang. We’ll see how I adjust back to hockey skates, it’s been a year or so since I last played. Say it ain’t so Garmin? What’s that? The motion based content has finally moved over to Garmin connect? And GC now accepts the Forerunner 305??? Whoooooohoooooooo now I need a dry day to go skate! So Sunday Natalie and I headed up to Creve Coeur park. She walked the dogs and I skated for the first time this year. Boy did I hurt by the end of it, I think most of the pain was caused by a loose frame on my skate, which I didn’t notice until before I went to go skate today. Sunday I went ~5miles in just over 30 minutes, with an average heart rate of 178, burning in excess of 1000 calories in that time period, at least according to the software. Today I went ~4.8 miles in just over 28 minutes, a better pace than I did on Sunday, with an average HR of 179, though I did have a break during today’s session as I ran into an old friend on the trailer and stopped to talk for 5 minutes. You can check out the results from Sunday and Today online at http://trail.motionbased.com/trail/user/chrishammond it even has a map. So I’m back in the fitness game, hoping to skate 4-5 times a week, I’ll try to get back out tomorrow, and might even try to get some in during the trip to Colorado this weekend, we’ll see how that goes. I need to get on the Wii fit so I can track any weight changes, and do some other workouts, perhaps I’ll do that in the morning. Well, it’s been almost a year and a half now since I purchased my Garmin Forerunner 305 , it has performed flawlessly the whole time, I’ve had no trouble whatsoever with the hardware. The word from Garmin the company however has been extremely lacking. Garmin has a site that you can upload content to called Garmin Connect, and while it appears to do everything I want with an online provider, it doesn’t work for the Forerunner 305 . Initially it was supposed to only work for the Forerunner 405 and 50, which it does, but they were gradually supposed to add support for other devices from Garmin. Well Garmin, when will the 305 support come? I’m not buying a Forerunner 405 until the 305 is supported, once that occurs then I can get the 405 and 305, so Natalie and I both have a GPS device to use. But why waste any money on the 405 if they won’t add support for their existing devices. Garmin, are you listening? Don’t even get me started on the “Motionbased” conversion that I doubt will ever happen. So this morning I was down 4lbs from my starting weight, down to ~259.9lbs. I figure getting down to 250lbs will be fairly easy, controlling my diet alone will probably get me there by the middle of the month if not earlier. I was 250lbs most of the summer, I think the trip to Vegas did that in last November. To win the contest though I need to do more than that, my personal goal for the end of the month is 240lbs, with 225lbs the goal for June 6th when the book is due to be published. So today after class I went to the YMCA again and walked another 3 miles today at a pace of under 15 minutes/mile, faster than yesterday’s three miles. So with my striving to win the Fit In February Developer Challenge I started back up with www.hundredpushups.com again. Day 1, week 1. Here’s my count for pushups today. Day 1 Week 1 calls for Pushups totalling 10, 12, 7, 7 then maxing out with a Minimum of 9. Day 2 will come Tuesday! So February First marks the start of the Fit In February Developer Challenge, and I am starting up my fitness goals again, so why not try for the challenge! MotionBased and Garmin Connect, worth the wait? So I’ve been a Forerunner 305 owner for almost a year now. I used it heavily in the beginning of the year, and kind of slacked off lately as I haven’t exercised much. I have however been waiting for Garmin Connect to open up to 305 users. If I recall correctly, it was supposed to be done in February of last year, then pushed out a few months, then to September, then December 08, and now they are pushing it out to February 2009. WTF Garmin. I mean really? I understand software delays, but seriously, do you have a single developer working on this? If so, fire that guy and hire someone else. Last summer I started the HundredPushups.com challenge, I made it two weeks I think before I quit following the program. Tonight I started back up. I am starting from scratch, it is a 6 week program, so my goal is to attempt my 100 pushups the week of Christmas. Though, if for some reason I get delayed or have to redo a week for not meeting goals I will attempt to complete the challenge before the end of the year. That still doesn’t leave me much time! I managed the match the requirements, I couldn't do any more than 15 at the end, it's fairly late and I played softball tonight, maybe I'm just worn out? Today I started Week 2 of the www.HundredPushups.com challenge, a day late, but better late then never! I must say, I can feel a difference. I felt great through all my sets, and ended up with 12-12-9-7-20 for a great start to Week 2. I will probably do Day 2 tomorrow and Day 3 on Friday in Milwaukee (heading up there for a race this weekend). With poker night last night I pushed off day 3 of week 1 for HundredPushups.com to today. Week three called for 15-13-10-10-15+, I managed 17 on my 15+ My chest/back/arms aren't hurting anymore, so hopefully that will stay for a while. Today was day number two of week number one for my hundredpushups.com challenge. Tonight's task was 12-12-10-10-10+, I managed 13 on my 10+ set. I'm curious to see if tomorrow hurts as much as the past two days have. I'm hoping the pain starts to go away! Today was not a fun day at work. It started out fine, but boy did my chest start to hurt from Day 1 of the HundredPushups.com workout! I'm not in near as much pain now, thankfully. We'll see how Day 2 goes tomorrow!